The Seventh Annual Art and Earth Juried Exhibit will open April 5 at the Berkeley Art Works, 116 North Queen Street in Martinsburg. There will be a reception and awards presentation on Friday, April 21 from 5-7pm. The exhibit will be on display through May 20. Gallery hours are Wed-Fri 11-5, Sat 11-4. 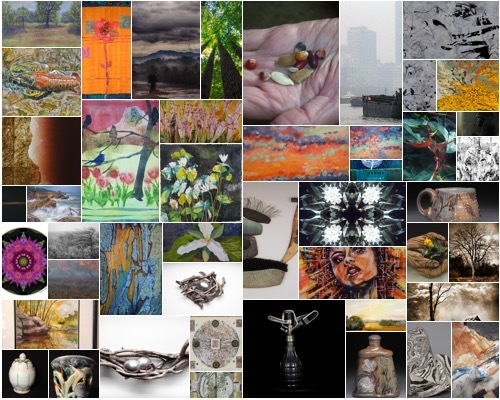 The Art and Earth juried exhibit attracted 144 works by 60 artists from 20 states. Juror Sonya Evanisko, of Shepherd University selected 46 works by 37 artists for the exhibit. Accepted works include paintings, mixed-media works, photographs, and a selection of ceramics and other 3-dimensional works. A full list of the accepted artists is on the Berkeley Arts Council web site at https://berkeleyartswv.org/art-and-earth-exhibit-accepted-works/.